Donald Trump’s loyalty pledge to the Republican Party: How the real estate magnate outsmarted Reince Priebus and the GOP. The real estate magnate didn’t just pledge his loyalty to the Republican Party. The GOP pledged itself to Trump. GOP presidential front-runner Donald Trump holds up a pledge he signed Thursday to support the Republican nominee in the 2016 general election, ruling out a third-party or independent run, on Sept. 3, 2015, in New York City. Donald Trump made Reince Priebus, the chairman of the Republican National Committee, come to him. Each of the candidates will likely sign this piece of paper and submit it to the boss. There are severe consequences for any candidate who breaches this agreement: Priebus will … give that candidate a look of disappointment, expressing displeasure. Perhaps Priebus will even issue a statement expressing his displeasure. In other words, there are no hard consequences for breaking this pledge. A candidate runs the risk of being labeled A Guy Who Breaks Pledges. But come now; if Trump were to run as an independent, he would simply come out and say that it was Priebus, the crooked establishment Republican Beltway insider fat cat, who reneged on the terms of the pledge by calling him a name, real or imagined. “I have no intention of changing my mind,” Trump said at his Thursday afternoon press conference in Trump Tower, following Priebus’ departure. And sure, that’s a statement of fact: Who has ever intended to change his mind? This is not the pledge that matters. Instead it was the Republican parties of certain states, most notably South Carolina, that brought Trump to a decision point. Palmetto State GOP leaders made inclusion on its primary ballot conditional on the signing of a loyalty pledge by Sept. 30. Trump was compelled to sign that and other pledges to get on the ballots. Priebus is just formalizing the states’ dirty work, like any good small-government federalist would. And as soon as primary season ends, Trump could break most of the state pledges, too. And yet, why would he? The logic behind a Trump independent run doesn’t hold up on the most basic level. If he remains atop the polls as time goes on—and his ceiling for support keeps growing—he will win the Republican nomination. If he collapses, then he collapses, and he no longer has the political support to make an independent presidential bid a worthwhile expenditure of personal resources. Still, there’s too much on the line for Priebus and fellow custodians of the GOP presidential nomination process to call Trump’s bluff. If Trump were to launch an independent bid, even one that attracted few percentage points, that would likely be the ballgame for the Republican Party. This dynamic left Priebus and state party leaders in a desperate position to do whatever was necessary to get Trump to sign a loyalty pledge and then pray that hopefully, hopefully it means enough to the real estate magnate that he feels compelled to honor his word. Priebus’ visit to Trump Tower further cements this reality television star’s transformation into a “real” presidential candidate who cannot be ignored or laughed off as the cycle deepens. And though Trump has signed this piece of paper saying he will and won’t do certain things next year, he has not signed any piece of paper requiring him to disavow the unorthodox nationalist, protectionist, tax increase–supporting agenda with which he’s carved his sizable lane. The Republican Party, however, has now committed itself to supporting this agenda, which goes against decades of its own dogma, if Trump is able to pull off the nomination. 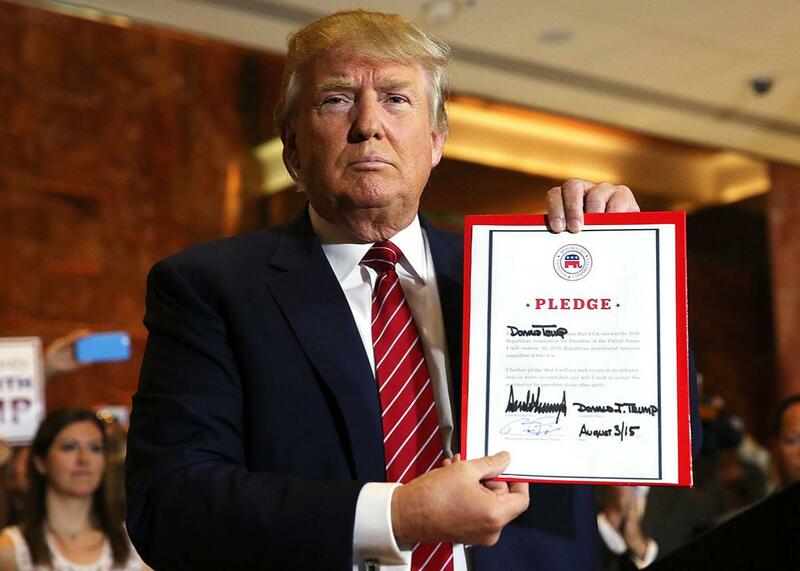 Most of today’s news has been framed as Trump signs pledge to support eventual nominee. Another way to look at it is Establishment Republican candidates pledge to support Donald Trump. Trump has not pledged to incorporate into his candidacy any of the cheerier tones or traditional Republican policies that the GOP establishment would like to see from him. The Republican Party, though, has agreed to incorporate Trump. In bringing his politics into the fold, the GOP has also handed Trump a shield just when he might need it. Jeb Bush’s campaign has begun the offensive against Trump’s political past, putting together a montage of Trump over the years stating that he’s pro-choice, a friend and admirer of Hillary Clinton’s, and an advocate for a single-payer health care system—all delivered with the same phony conviction that he wields now to emphasize the opposite. Now, when Bush or whoever else uses these attacks against Trump on the trail or at the next debate, Trump can fire right back: Didn’t you see Reince Priebus come to my office? Didn’t you see me just pledge my support to the Republican nominee? If I were a liberal, why would I do that? “I will be totally pledging my allegiance,” Trump stated Thursday, in one of his most devilishly Trumpian formulations yet, “to the Republican Party and the conservative principles for which it stands.” And the Republican Party has pledged its allegiance to him.